Canadians might remember 2007 as the year that climate change began biting deep and hard on the home front. At the top of the world, the dramatic disappearance of Arctic sea ice - reported in September - was so shocking that it quickly became our number one weather story. Indeed, the United Nations declared the record loss of ice as one of the world's biggest events. The thinning and shrinking of the ice, largely a result of too many consecutive warm years, has had a profound impact on northern residents - people, plants and wildlife alike. The disappearance of water from the Great Lakes system is also a concern, especially Lake Superior where water levels in September dipped to their lowest point since measurements began in 1900. In many ways, the record loss of ice and water is more about climate than weather and underlines that climate change is beginning to affect Canada in a very real way. At times in 2007, the West had too much weather. Residents on the Prairies witnessed a record number of severe summer weather warnings, with tornadoes, intense rainfalls, wind storms and hail storms. August's destructive hailstorm in Dauphin, Manitoba, for example, was only one of 279 hailers that affected the Prairies in 2007. Crop-hail losses approached $200 million and, for the first time, exceeded premiums. There was also an enduring high humidity on the Prairies that became unbearable and suffocating, culminating in a new Canadian record humidex of 53 set at Carman, Manitoba. On the other hand, southern Ontario had very little weather with one of its driest summers in over 50 years - part of a ten-month dry spell that lasted from January to October and produced record dry conditions in many locations in the region. Winters at the beginning and end of the year provided stark contrasts and two more weather stories. The shocker of a green Christmas Day in 2006 in Quebec City, Timmins and Thunder Bay - where a white Christmas is all but guaranteed - turned out to be a one-year blip. For snow and ice enthusiasts, the beginning of 2007 continued the quest for winter. When it did come, while persistent, it was too late. Nature tried to make amends at the end of 2007 with some pre-winter blasts of cold, freezing rain and lots of snow, making the first half of December 2007 a white one to remember. Also dominating this year's top weather stories were menacing floods in British Columbia. With a record deep mountain snow pack, the threat of flooding tormented thousands of residents for months. 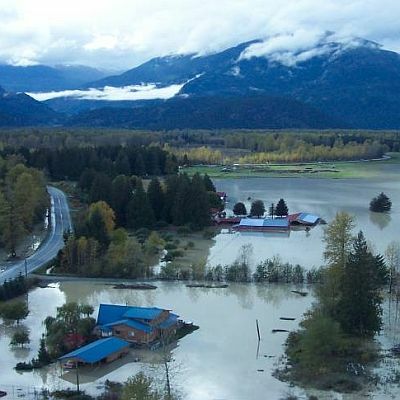 But while devastating floods occurred in the central interior and north coast, lucky residents along the Fraser River were spared when a major storm changed directions at the last moment. Luck was also a factor in Elie, Manitoba, when Canada's first documented F5 intensity (the highest rating on the internationally recognized Fujita tornado damage scale) tornado with winds above 420 km/h touched down on June 22. Most residents were away when the tornado struck. In Atlantic Canada, one of the big stories was the passage of Hurricane Noel in November. While no Juan, Noel's winds and waves destroyed several beaches, wharves and docks. Fortunately, there were no casualties. People were well prepared and seemed respectful of the potential destructive power of the massive storm. While property damage from weather extremes like Hurricane Noel cost Canadians millions of dollars in 2007, the price tag was less than we've seen in recent years. Thankfully, deadly tornadoes, devastating hurricanes, widespread droughts and plagues were a "no show" for this year. In general, it was another warm year for Canada - the 11th year in a row - although not as warm as it has been in recent years. The year tied for the second warmest winter on record, some 3°C warmer than normal. Summer was the seventh warmest at about 1.0°C warmer than usual, and from January to November the national average temperature was around 1.0°C above normal. Every region was warmer, especially the Eastern Arctic, which experienced its fourth warmest January-to-November period on record. Globally, it was also another warm year according to the World Meteorological Organization (WMO). Surface temperatures averaged 0.4°C above the annual average of 1961-1990 and the northern hemisphere was estimated to be the second warmest on record since the beginning of the 20th century. On September 12, satellite images over Arctic waters revealed that sea ice in the area had shrunk to about 4 million square km - a minimum not seen for possibly more than a century. The ice shrinkage stunned scientists, who found 23 per cent less sea ice than the previous record of 5.3 million square km in 2005. It was as if an ice chunk the size of Ontario had disappeared in one year. Since 1971, and particularly since 1990, sea ice in the Arctic Ocean has been decreasing significantly on a hemispherical scale. But this year’s “big melt” was a shocker. The main channel through the Canadian waters of the Northwest Passage was nearly ice-free and completely navigable for about five weeks in August and September. Of its 2,300 km length, there was only about 20 km of ice instead of the usual 400 km. In 2007, ships as small as sailboats could have plied the normally ice-infested waters of the venerable Passage -- and nearly 100 vessels did. 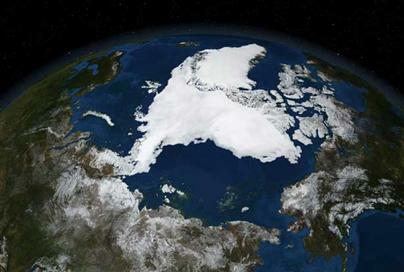 The unprecedented shrinkage of Arctic sea ice is a direct response to several years of favourable Arctic winds pushing old ice into the Atlantic, as well as persistent, year-round warming of the North and a dramatic transformation of its surface from a highly reflective white snow or ice to dark heat-absorbing sea water. The last two winters were the warmest on record in northern Canada, with 2005-2006 the warmest in the past 60 years. Further, 5 of the 10 warmest years in the past 60 have occurred since 2001. The last cold winter occurred nearly 15 years ago. This year’s Arctic ice shrinkage (similar to what some climatologists envisioned would happen 30 years from now) meant the 2007 fall freeze-up started from a huge deficit, making it harder for the ice to grow back and increasing the likelihood that sea ice will shrink even more next summer. 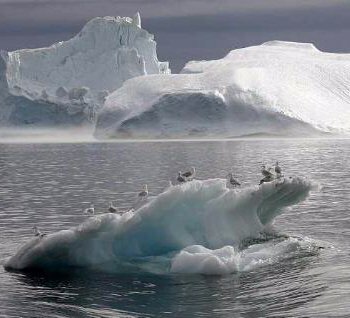 Scientists are now even more convinced that the Arctic climate system is heading toward a more ice-free state during the summer months, and that human-caused global warming is playing a significant role. And while the disappearing ice is having an immediate impact on northern peoples, the effects of this unprecedented loss outside the Arctic is uncertain. What we do know is that ice exerts an enormous control on global climate and its sudden loss could have profound impacts on weather well beyond the Arctic’s borders. In early spring, experts from the British Columbia River Forecast Centre began bracing for and warning of the potential for the worst flooding in the province’s history. While most were focused on wild wind storms and falling trees, the mountain snowpack was accumulating at a record rate. It was great news for skiers and unprecedented numbers enjoyed the deep snow, but the growing snowpack was a threatening menace to those along swollen water courses, especially in north-coastal British Columbia and in the south along the Fraser River. Adding concern was the loss over years of huge tracts of lodgepole pine decimated by the pine beetle, reducing the watershed’s ability to store and slow release meltwater. Snow water content ranged from a low of 83 per cent of normal in the Okanagan to 130 to 165 per cent of normal along the coast, in the north and in central regions. In the Fraser River, basin snowpack was amongst the largest measured since 1953, when detailed snow measurements began, and only slightly below that of 1972 when major flooding occurred. Officials began distributing close to five million sandbags to various “hot spots” and soldiers were ordered into the Lower Mainland in anticipation of rising waters. In early April, unseasonably cool, wet weather not only delayed the melt but continued the build-up of snow. A month later, the snowpack had not diminished much and was ripening rapidly. Experts outlined a worst-case scenario: week-long heat followed by heavy rains before the usual peak river flow in June. Right on cue, hot weather arrived in late May with five days of +30°C temperatures. Scorching weather from Vancouver to Burns Lake smashed more than two dozen temperature records by 3 to 5°C, rapidly melting the mountain snowpack and swelling water courses in the Fraser River system and in the North-West. Behind the heat was more bad news – a widespread rain-bearing storm poised to move inland from the Pacific Ocean, escalating the flood risk for the Fraser River and the Lower Mainland. As it happened, the frontal system largely missed the Fraser watershed concentrating instead on the Bulkley and Skeena basins to the north. The Nechako River peaked near a 50-year return period flow, and stayed at that extreme high for a five- to six-week period. The Bulkley River (at Smithers) exceeded its 100-year return period. The Skeena River experienced a 35-year return period event. Along the banks of the Skeena, the City of Terrace was nearly marooned when rising waters and landslides forced the closure of several roads and highways and swamped rail lines. In the Bulkley-Nechako and Kitimat-Stikine basins, rising waters washed out secondary roads, shut down a bridge and cable ferry and led to the closure of a highway. Food and fuel hoarding started in Prince Rupert and Smithers, where flood waters rose to their highest levels in more than 80 years. In the south, the long worry was over. By June 11, all monitored rivers had peaked or were falling. In the end, levels on the Fraser River never challenged the heights of near-flood years. The Fraser Valley avoided a catastrophe when cooler temperatures returned and a soppy storm diverted away at the last moment, sparing thousands of hectares of farm and residential land, avoiding the evacuation of tens of thousands of residents and saving an estimated cost-loss of $6 billion. Before winter officially got underway on December 22, winter weather struck with vengeance right across the country. On the first days of December, up to 50 centimetres of snow fell on parts of Vancouver Island followed by a warm soppy rain in excess of 100 mm. It was brutally cold across the Prairies with a -40 wind chill and a massive storm from Colorado spread meteorological mayhem into Ontario and Quebec. In Atlantic Canada, a fierce winter storm was already underway, just ahead of the Colorado low that struck with a one-two wallop. For a time at the beginning of December, a white Christmas mantle covered Canada from coast to coast to coast. Almost overnight on December 2, the Pacific coast swung wildly from one extreme to the other as warm tropical rains replaced a winter storm. Victoria and Vancouver avoided the big snow dump with only 12 cm, but the Vancouver Island community of Campbell River was buried under more than 50 cm of snow. The day after winter's first blast, a subtropical airmass from Hawaii -- dubbed the Pineapple Express -- ushered in warm air and drenching rains. With a forecast for 100 to 150 mm of rain in 24 hours, the British Columbia Ministry of the Environment issued a flood watch for Greater Vancouver, south and central Vancouver Island, Howe Sound and the lower Fraser Valley. In the interior, flood and avalanche watches were issued for upper reaches of the Fraser River where more than 200 mm of rain soaked the snowpack. The heavy snow-rain deluge kept students home from school, closed roads, cut power and created deadly driving conditions. Rising waters and avalanches isolated several interior communities for days. On December 3, Ontario struggled through its first big winter storm that featured an ugly mixture of snow, freezing rain, ice pellets and rain. London got 60 cm of snow from the initial storm and from almost continuous lake-effect squalls over the next couple of days. Thousands of students stayed home for two days as icy roads and blowing snow made travel treacherous, especially north of London. Almost 200 drivers in the London area showed up at a local collision reporting centre on December 3, setting a record for the worst day ever for crashes. In Ottawa, the storm dropped 24 cm of snow in a 24-hour period. Montrealers dug out of more than 35 cm of snow, which was a record for December 3. Whipped by strong northeasterly winds up to 50 km/h, road surfaces in southern Quebec became treacherous and visibility was at times minimal. The storm then moved on to Atlantic Canada, where residents were still recovering from a two-day blast to the region featuring snow and strong winds. During the initial storm, parts of northern mainland Nova Scotia and most of Cape Breton got 10 to 20 cm of snow and winds gusted to 90 km/h. When the second storm moved in from Ontario and Quebec, it focused its force and misery all over Atlantic Canada. In New Brunswick, an additional 40 cm of snow fell onto what had already fallen a day before in blustery 70 km/h winds. Moncton ground to a halt with a combined two-day snowfall of 55 cm swirled in wind gusts peaking at 83 km/h. A storm-surge along the coast from Escuminac to Cape Tormentine coincided with the high tide, adding an extra 1.3 to 1.5 metres to the depth of the water. Halifax and Charlottetown were hit with 20 cm of snow fanned by winds of 90 km/h. Repair costs to electricity lines and towers in Prince Edward Island exceeded $1.5 million and were expected to take months to complete. Maritime Electric said it was by far the worst storm the utility has seen since the 1970s, if not the worst ever. And it only got worse in Newfoundland and Labrador. Winds gusting up to 124 km/h created blizzard-like conditions along the Bonavista Peninsula and the southern part of the Avalon Peninsula. As much as 25 cm of snow blanketed the ground on December 2. The entire downtown of St. John's, Newfoundland was plunged into darkness. In eastern Newfoundland, snow and wind from a weekend storm toppled about two kilometres of transmission lines along with seven two-pole towers. The fact these main lines were in a remote and difficult terrain hampered repair efforts. Newfoundland Power officials said the storm - with its heavy, wet snow, thick ice and high winds - was one of the most damaging in the past 10 years. Close to 10,000 customers on the Bonavista Peninsula were without power for up to a week. In terms of snowfall, the largest on the Island was in Terra Nova National Park, where it was estimated close to 65 cm fell. Each summer across the Prairies a couple of weeks of warm, sunny weather is expected and welcomed. But for several weeks this summer, hot, thick, and unusually sticky air tried the patience of many Prairie residents, playing havoc with everything from hospital surgeries to people's hair. Calgarians suffered through their second hottest July on record, a mark set more than 70 years ago in 1936. Edmonton International Airport recorded its highest average July temperature at 18.4°C, eclipsing the high mark set only last year. It was a scorcher in the Alberta capital. On seven days, the maximum temperature soared above 30°C. Normally, only one day would hit that high in July, if at all. In Regina, it wasn't the hottest July on record, but the warmest most residents could remember. Three hotter Julys occurred in 1886, 1936, and 1937. The big talk was the uncharacteristically high humidity. The controlling weather system - a huge upper ridge situated in the American Midwest - was a little farther east than normal, enough to tap moisture from the Gulf of Mexico and move it into the Prairies. Combined with local sources from transpiring crops and evaporating surfaces soaked by copious spring rains, it filled the air with insufferable humidity. From July 22 to 24, Regina recorded 29 hours of humidex values above 40, including a reading of 48 for two consecutive hours, shattering the previous record of 44.5. Without question, it was the most uncomfortable spell of weather in Regina's history. If it was sultry in Regina, it was downright oppressive in Carman, Manitoba. On July 25 at 3:00 p.m. CDT, Carman registered the day's maximum temperature at a sizzling 34°C with a dew point of 30° - literally jungle humidities. (It is unconfirmed, but the 30° dew point might be a new record high in Canada.) The combination of excessive heat and humidity generated a humidex rating of 53, breaking the all-time Canadian record of 52.1 set in Windsor, ON on June 20, 1953. On the same day, Winnipeg's humidex reached 48, breaking its all-time record of 46.1 set in 1996. Unsafe humidity levels forced the cancellation of hundreds of elective surgeries at several hospitals across the west. High humidity compromises sterile equipment and increases the risk of post-operative infection. The elderly found it hard to cope with the high heat-humidity, which often causes nausea and dizziness from exhaustion and dehydration. Horses at Winnipeg's Assiniboia Downs were given time off because of the danger of heat stroke. Stores struggled to keep fans and air conditioners in stock. Finding air conditioning was only half the battle; getting it installed or serviced was a two-week wait. The warm moist air put a strain on utilities and helped establish a new summer record for power consumption, coming close to winter's record peak load. In some spots, bloated fish floated onto the shores of several overheated lakes, streams and reservoirs. "Summer kill" occurs when high temperatures and little or no wind create oxygen depletion, suffocating fish. Hundreds of dead ducks also turned up in lakes east of Calgary, probable victims of a toxin that thrives in hot, dry weather. The extreme heat and humidity also wreaked havoc on crops, hitting canola and peas the hardest. Scorching temperatures and dry skies reduced grain yields and lowered quality across the West. In some areas, it was a disappointing year with a double weather whammy - a wet spring and torrid heat in summer. Excessive heat and dryness, however, meant fewer crop diseases and pest problems and advanced crop development. For the majority of city dwellers in southern Ontario, it was a summer to remember with record warmth, perfect weekends and little weather. The number of hot days above 30°C ranged between 20 and 30 -- two to three times the normal. On the 31 weekend days and holiday Mondays from June 1 to Labour Day, Toronto had only five wet ones (often just a sprinkle). Most residents in the south didn't want summer to end. It was so pleasantly warm for so long that they either felt guilty or concerned that somehow they were soon going to pay for the excess of delightful weather. What was good for campers and beach bums, though, was bad for farmers and gardeners. Although not a drought by Prairie standards, southern Ontario's drier weather could only be rivaled by conditions not seen in the region since the 1930s. You didn't need to be a climatologist to know record dryness was underway. Burnt grass, cracked soil, curled up leaves, shriveled corn cobs, and dying trees were the giveaways. Even dandelions were dying. Grass fires sparked by dry conditions prompted many local fire departments to slap bans on open fires. Water alerts were issued early and often. Scanty precipitation ravaged thousands of trees. Many died, while others just hung on or were badly stressed making them vulnerable to pests and disease. Arborists warned the disaster would be better revealed over the next two years. Blessed with near-perfect spring weather, Ontario farmers planted a record corn crop estimated at 880,000 ha. The results were disappointing but yields varied as much as the rainfall, ranging between 40 and 550 bushels per hectare just a few concession roads over. On the other hand, fruit and grape growers in Niagara were delighted by the warmth, abundant sunshine and disease-free conditions. They couldn't recall a year with better fruit flavour. The prolonged drought prevailed across a broad swath of Ontario from Chatham north to Peterborough. No area showed the wear-and-tear of drought more than Toronto. Toronto Pearson International Airport experienced its driest summer in nearly 50 years and a string of 95 consecutive days without a significant rainfall (above 12 mm) in the middle of summer. Moreover, it was a 10-month drought. Between January 1 and October 31, the Greater Toronto Area (GTA) experienced its second driest on record. Toronto received only 413.2 mm of precipitation, which is about two-thirds of normal levels. To the north in York Region, it was even drier. Aurora's rainfall totals from May to September amounted to a paltry 136 mm (compared to 215 mm in Toronto) and only 1/3 of the total rainfall in 2006. In Hamilton, between May and August inclusive, 141 mm of rain fell, which is only 37 per cent of the normal accumulation. It was the lowest rainfall total since record-keeping began in 1959, smashing the record set in 1966. In the country-side of Norfolk County, it was even drier with only 35 per cent of normal amounts from May to July inclusive -- the worst since 1936 when heat baked fruit on trees. It was so dry at times that the Ontario Ministry of Natural Resources asked anglers not to fish in some creeks, because water levels were so low it stressed fish. And so dry that the Delhi Horticultural Society had to cancel its flower show because the blooms had wilted. Fifteen named storms, including six hurricanes, occurred in the North Atlantic during the 2007 hurricane season. Tropical storms numbered five more than usual, although their accumulated energy was well below normal because many of the storms were either weak or short-lived. While there were fewer hurricanes than anticipated, Dean and Felix reached Category 5 status and were big killers along with Noel. Hurricane Noel was the most powerful storm to hit Atlantic Canada in 2007. Until its arrival in early November, the tropical storm season in Eastern Canada was looking like one of the quietest in 20 years. The only other tropical visitor was Chantal. It slammed into eastern Newfoundland and Labrador on July 31 causing several millions of dollars in damages. At Argentia, almost 200 mm of rain fell in 12 hours -- double the historic rainfall amount. Flooding rains washed out bridges and submerged roads, basements and parking lots. In St. John's, the storm forced the cancellation of the annual Royal St. John's Regatta, one of the oldest continuous sporting events in North America. Noel was the second last of the year's tropical storms and also the deadliest. It wreaked havoc on the Dominican Republic, Haiti, Cuba and the Bahamas and in doing so killed more than 147 people before heading north. In Canadian waters, Noel was neither a hurricane nor a tropical storm but a huge, vigorous storm referred to by meteorologists as a post-tropical storm. Its centre moved into Canada near Yarmouth, Nova Scotia, crossing southeastern New Brunswick, the Gulf of St. Lawrence and finally moving through central Labrador. Fortunately, the storm arrived during the low monthly tide cycle, minimizing the danger of tidal surges or flooding. Ocean-wave heights peaked at 14 metres on Georges Bank. Sustained winds exceeded 135 km/h. In the Wreckhouse area of southwestern Newfoundland -- one of the windiest places in the world -- local winds gusted as high as 180 km/h. The sprawling system extended over a million square kilometres. It dumped 60 to 80 mm of rain through southern New Brunswick and western Nova Scotia, and as much as 130 mm in northern Cape Breton Island, generating some minor street flooding and filling basements. The storm brought heavier rains to Quebec's Gaspé -- 90 to 100 mm. Farther north, heavy snow in excess of 35 cm fell from Sept-Iles to Rimouski. In northern Labrador, about 20 cm of snow fell. Noel was a nasty storm -- bigger than Hurricane Juan four years earlier, but much weaker -- causing a lot of damage and inconveniencing thousands of people, but sparing life and limb. Powerful winds took thousands of trees down, scattered fences and downed power lines across Atlantic Canada. At one point, almost 200,000 homes and businesses were without electricity. The greatest impact from Noel was the coastal damage done by huge powerful waves along the entire western half of Nova Scotia's Atlantic coast. Wind and wave action destroyed several beaches, hurled rocks and obliterated or severely damaged countless wharves, docks and fishing sheds. A mitigating factor was the storm's late arrival after most trees had lost their leaves. Still, Halifax's scenic Point Pleasant Park, which bore the brunt of Hurricane Juan, was hit again but with far less damage. Trillions of litres of water have recently vanished from the Great Lakes -- a system containing 20 per cent of the world's fresh surface water. In September, Lake Superior set a record for its lowest water level for this time of year since measurements began in 1900. Persistent drought and warmer temperatures pushed levels 10 cm beneath the previous monthly low reached in 1926. Further, water flow from its outlet on the St. Marys River plunged, which bodes ill for the Great Lakes system because Lake Superior is the single largest source of water replenishing the four downstream lakes and the St. Lawrence River. By December 1, water levels on Lakes Michigan-Huron were also sagging, more than two-thirds of a metre below average and about a metre lower than a decade ago. Water levels were just 8 cm higher than their 1964 record low for the same time and the lowest they have been in December since then. Whereas Ontario and Erie were down one-quarter and one-fifth of a metre from the long-term average, respectively, levels of the St. Lawrence River at Montreal were more than one metre below average -- its lowest since modern records began in 1967. But it was Lake Superior that garnered most of the attention and explanation. Its levels have been consistently below average for 10 years. More telling though, from June 2006 to May 2007, water supply to the lake was the lowest for any 12-month period on record. Of note, Superior's precipitous decline was halted dramatically in October when the northern basin got a "monsoonal" drenching of twice its normal rainfall. The water supply in October was a new record maximum with some 20 per cent more than the previous record for that month. Instead of falling 4 cm, which it normally does in October, Superior's watermark rose 14 cm. On November 1, levels were 20 cm higher than they were six weeks before. However, by month's end, low supply conditions had returned to Lake Superior. Rapidly shrinking water levels were a big challenge for commercial navigation. Freighters had to reduce their draft, thus lightening their loads by upwards of 10 per cent. Shallower waters also disrupted spawning grounds for fish and wetland wildlife, and created hardship for recreational boaters. Several marinas undertook dredging, while many private owners were left high and dry. As well, hydro-electric generation was reduced due to lower flows in the system. Falling water levels in the Great Lakes have raised questions about the impact of climate change. Are we seeing much sooner what scientists forecasted would happen decades from now? There is no question that Superior's levels are being driven down in part by a lack of precipitation. In 2006, Lake Superior basin-wide precipitation was at its lowest since the mid-1920s, pushed down even further in early 2007. In recent years, the snowpack has been unusually scanty. Further, the lake is getting warmer, both above and below the surface. From 1979 to 2006, summer water temperatures rose about 2.5°C, twice as much as the overriding air. With half the winter ice cover found 30 years ago, more of Lake Superior's water is being lost to evaporation year-round. All this is setting up a pattern of "warmer water, less ice, more evaporation" that is leading to lower water levels. At mid January, the ground in Eastern Canada was soft, lakes and rivers were free of ice, there was no snow, and leaves were still on trees. Nature was confused and snow fans were depressed. Generally, Canadian winters have become warmer and drier, but following the warmest winter on record in 2005-2006, there was a sense and hope by some outdoor enthusiasts that this winter would be more typical. With the emergence of a warm El Niño, the odds increased for another soft and open winter. Owing to a persistent flow from the south and west, much of Canada experienced an incredibly mild beginning to winter. Until the third week of January, winter’s temperatures were closer to those expected in fall and spring. In Alberta, warm winds heightened the avalanche threat. In normally frozen Winnipeg, it rained in January and spring-like weather encouraged hordes of golfers in Montreal. In Niagara region, ice wine producers sat idly by as birds ate their grapes. In Quebec, the maple sap ran for two weeks in January – puzzling growers as to whether it was good or bad news. In Halifax, buds were swelling and bulbs were sprouting. The beginning of winter in December 2006 was spectacularly mild across Canada, setting a record for the warmest in the past sixty years. By the first official day of winter, most Easterners still hadn’t experienced any significant cold or snow. Less than a centimetre of snow had fallen in Toronto. Similarly, Montreal had 11 cm by December 21 compared to 75 cm by the first day of winter in 2005. And it wasn’t until January 16, before Montreal recorded its first cold day below -20°C. By that time, the city should have had eight or more on record. It wasn’t winter’s record warmth that became the big talk, but its persistence - day-after-day, week-after-week and now month-after-month. Was this the year when winter would be cancelled? Was the Canadian reputation as the great white north in question? It was even too warm to fake or make the white stuff. A protracted January thaw dealt a crippling blow to Ontario ski operators. Blue Mountain Resorts laid off over 1,300 seasonal and part-time employees for more than three weeks. It was the first time the resort had been forced to shut down after a season opening. With such mildness, a lot of mice, bats, rats and other pests were busy breeding not sleeping. Even frogs, flies and bees were out and about. African animals at the Toronto Zoo were spending hours outdoors. The mindset was that winter was cancelled. For beleaguered retailers, long underwear sales stalled and snow shovels and winter boots filled store shelves. The good news was that the mild weather meant lower heating bills. In the first half of winter, residents in Ontario and Quebec saved 15 to 20 per cent on their home heating bills. Municipalities saved millions in snow removal costs and re-deployed workers for pothole repair. With air temperatures more like April than January and the ground free of frost, construction workers put in long hours in unseasonably mild and dry conditions. Paramedics reported fewer cases of frostbite and hypothermia. And it wasn’t cold or snowy enough to warrant weather-induced heart attacks. Apart from areas directly to the lee of the Great Lakes, total seasonal snow didn’t amount to much. At Toronto, it was the second least snow amount ever in winter - 60.3 cm compared to a norm of 115.4 cm. Prince Edward Island broke an all-time record for low snowfall totals. Charlottetown’s total snowfall barely got above 100 cm by the end of February (46 per cent of its normal amount). Halifax and Sydney, Nova Scotia and Moncton, New Brunswick also received less than half their normal snow totals to the end of February. For Montreal, arguably the snowiest major city in the world, only 56 per cent of its normal October-to-February snowfall occurred. As an aside, snow was plentiful in Western Canada. Alberta cities were white most of the winter. In Calgary, nearly 50 per cent more snow than normal fell, and in Edmonton snowfalls amounted to 28 per cent higher than normal. At British Columbia’s ski resorts, snowfall totals approached record amounts and the number of skier visits was way up. With two months of skiing to go at some resorts, they were already about to surpass last year’s nearly six million visits. Snow bases at Grouse and Seymour near Vancouver varied between 400 and 500 cm in early spring. Whistler boasted its best year ever with a snow base of 300 cm well into June. Eventually, winter did come to the East. During the second half of January, cold Arctic air began to inch across central and eastern Canada. It had been the longest delay of winter weather in eastern Canadian history. Winter’s first storm, albeit two months late, created the usual “first storm” chaos with traffic snarls, flight delays and cancellations, slips and falls, parked school buses, and long waits for road-service battery boosts and tows. On January 20, Montreal received its first major snowfall of 20 cm. Throughout the day, hundreds of cars slid off snow-covered highways or slammed into other vehicles in a rash of minor fender-benders as snow blanketed southern Quebec. Winter’s cold might have been late coming but it persisted for weeks. By February 18, Toronto counted 30 straight non-melting days. The cold caused thousands of residential and city pipes to freeze and break. For patient backyard ice makers, it was the best six weeks ever without a thaw. In the final wrap-up, winter in the East lasted about six weeks - not even close to the six months it can sometimes feel like. Weather forecasters were kept busy on the Prairies with the most active summer ever for severe weather. Abundant spring rains followed by excessive heat and humidity and an active jet stream was the perfect recipe for violent weather. Alberta, Saskatchewan and Manitoba had the most number of summer severe weather events ever (410 in total) eclipsing the previous high of 297 set only last year. Especially frequent were the number of hail events, setting record numbers for all three provinces. It was a “hail” of a summer for the insurance sector. Summer storms pulverized crops, battered homes and businesses and pockmarked vehicles at a rate not seen in more than a decade. According to the Canadian Crop Hail Association, Albertans filed over 4,700 crop-related hail claims - the highest ever by far, exceeding $60 million or 27 per cent more than that collected from premiums. Saskatchewan counted nearly 14,000 crop-damaged hail claims, exceeding the five-year average but lower than the total recorded in 2006. Total payouts were estimated at $115 million for an 87 per cent loss-to-premium ratio. Hail storms were so frequent in Saskatchewan that many farmers reported multiple hits, especially in the Kindersley and Biggar area. In some instances, the first claim was still being settled when hailers struck a second or third time. The frequency of storms was up and so was the severity. In places, crops were totaled and property damage was extensive to homes, vehicles and farm equipment. Next door in Manitoba, crop claims topped $14 million, shattering the previous record of $10.6 million in 2002. Total claims were just shy of 5,000, which was very close to the record in 2000. The most spectacular hailer occurred on August 9 in Dauphin, Manitoba and nearby communities. The 30-minute storm featured a multitude of lightning flashes, intense rain, screaming winds and enormous hailstones - some the size of grapefruits. Around Grandview, Roblin and Ste. Rose, it took only minutes to destroy healthy crops only days from harvest. 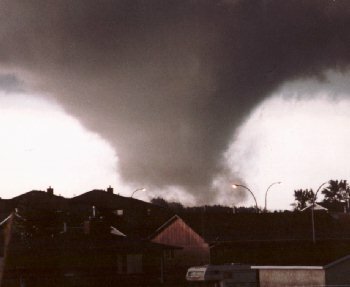 In Dauphin, the storm triggered about 13,000 claims to Manitoba Public Insurance (MPI) with an estimated loss of $53 million - one of the single largest catastrophic events in MPI history. More than 60 per cent of damaged vehicles in town were total write-offs. Truckloads of replacement windshields and dozens of workers were brought in from Brandon and Winnipeg to handle repairs. Most buildings suffered dented roofs and lost shingles. Contractors estimated property repairs could take as long as two years to complete. The hailer shredded backyard gardens into cole slaw, denuded trees, smashed greenhouses and punched fist-size holes in once-inflatable plastic roofs. The force and devastation of the tornado were unbelievable. Its strong winds sandblasted the bark off trees and severed utility poles as if they were toothpicks. The tornado picked up an entire house and carried it a few hundred metres through the air, where it exploded. Streets and nearby fields were littered with debris from trashed buildings. Winds pushed two semi-trailers off the highway, leaving one truck twisted like a pretzel a few hundred metres away in the middle of a field. The next day another night of severe weather occurred when multiple tornadoes ripped through southern and western Manitoba. The worst damage was south of Baldur, 75 km southeast of Brandon, where an F3 twister struck with wind speeds between 253 and 330 km/h. The winds snapped more than 200 hydro poles across the south and uprooted hundreds of trees in Whiteshell Provincial Park. Winds also knocked over several Manitoba Hydro towers and damaged more than 1,000 cottages. At least three people from a RV park went to hospital. 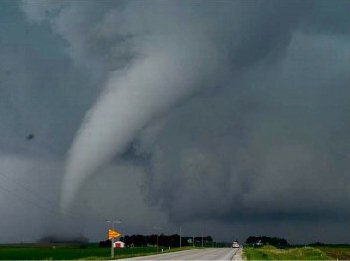 Eight tornadoes in one weekend is highly unusual in Manitoba - that’s two-thirds of the tornadoes reported in the province in all of 2007. Canada ranks second in the world for tornado occurrences, experiencing an annual average of 80 to 100. The United States is number one with an average of 1,000 to 1,200 each year. While Canada has never recorded an F-5 tornado before this year, the United States usually reports one or two yearly. In early April, heavy rains in the upper reaches of the Red River in North Dakota caused a significant rise in water levels. When ice jammed at the mouth of the Winnipeg floodway, major flooding occurred around and north of Selkirk, Manitoba. Waters from the swollen, ice-filled Red River rose to the floorboards in some homes and over the hoods of a few vehicles. On April 4, 100 seniors in Selkirk left their riverfront condominiums. At the Marine Museum of Manitoba, raw sewage spilled into the collection and ice-infested waters pushed ships off their foundations. The return of chilly weather in early spring stalled the massive ice jam north of Selkirk. Frozen Lake Winnipeg and troublesome frazil or slushy ice slowed the river flow - making it one of the longest ice jams in the province's history and one of the biggest ever seen on the Red River. By mid-April, the flood watch ended when the Red River dropped more than a metre in less than a day and citizens started the arduous cleanup. However, flooding in Manitoba was not over. Water levels remained above normal during May and June when late spring rains were 33 per cent above normal and cool temperatures slowed the melt. What followed became the third largest summer flood on the Red River behind the summers of 2005 and 2002. On the morning of July 2, the Red River in Winnipeg sat at 4.6 metres - about 3 metres above normal. Lake Winnipegosis was at its highest level since the 1950s. Nearby campgrounds and popular hiking trails remained partially flooded and closed for most of July. In Saskatchewan, it was the third year in a row that heavy spring rains and extensive flooding hurt farmers in northern and central parts of the province. Sixteen communities declared a state of emergency because of rising waters from rapidly melting snow. Over 100 emergency workers with the Red Earth First Nation worked tirelessly in that community to save homes when floods threatened on April 22, just days after half the residents were evacuated. Water levels in Fishing Lake, about 200 km east of Saskatoon, were higher than local authorities had ever seen, with a further 30 to 40 cm coming. In late April, while residents built wave breakers and filled sandbags, emergency officials urged others to pack up and leave. Nearby, Waldsea Lake stood 534.8 metres above sea level, a metre higher than last year. For two more weeks, winds tossed ice slabs onto lakefronts and beaches around Fishing Lake. Ice crushed piers, downed hefty trees and shoved sheds and boats into the woods. When the ice no longer threatened, gusty 60 km/h winds generated waves as high as one metre. Dykes failed from repeated hammering by ice and waves and water flowed into homes and cabins. More flooding in northeastern Saskatchewan in late May followed a week of heavy rains. Farm fields lay under water and crops seeded early started to rot. Spring flooding in Alberta was focused in the northern half of the province where a heavy snow pack (amounts seen once in 25 years) increased the flood risk in the Grande Prairie, Peace River and High Prairie areas. For the second June in a row, heavy rains drenched southern Alberta on several occasions. On June 5, a one-hour severe thunderstorm centred on Calgary generated instant flooding, swamping vehicles and inundating homes. Several people paddled in rubber rafts along downtown streets as waves swirled in flooded intersections. Emergency crews waded into waist-deep waters to rescue motorists trying to float vehicles. At a cemetery, flood waters damaged 200 graves and washed away a number of precious mementos. Estimated losses totaled $10 million to flooded basements and roadways. Rainfall intensities approached 100 mm in 18 hours, nearing 100 year-returns. Also on June 5, at Stoney Plain, west of Edmonton, torrential rains of 50 to 80 mm - along with marble-sized hail - flooded the city in a two-hour period. Drivers of big pickups rushed through water a metre deep, angering homeowners whose already flooded basements were flooding again with each passing wave. The storm uprooted a few big trees and blew off man-hole covers releasing a geyser. It was hailing and raining so hard you couldn't see a metre in front of you. Although parts of Edmonton got 50 mm, less than 3 mm fell at the city airport. Two weeks later, another heavy downpour deluged Southern Alberta, breaking a 110-year-old rainfall record for the day at Calgary. Several communities along the tributaries of the Bow River, west of Calgary, got 70 mm of rain over the Father's Day weekend forcing rivers to surge their banks. Rising waters flooded many golf courses in the Foothills keeping all but the die-hard golfers away. Following near-record warmth during the first week of January, winter turned vicious across Western Canada when a huge winter storm brought icy blasts and deep snowdrifts to much of the West. The storm's wrath was felt no where more than by residents of Saskatoon. On January 10, the most intense blizzard in half a century struck Saskatoon and region, claiming four lives and marooning the entire city in a humongous whiteout. Storm-stayed residents aided friends and strangers alike by pushing and shoveling and caring. Many businesses sent employees home early and kept their doors open to provide shelter. Motorists waited patiently for hours in interminable traffic jams, stuck on highway ramps or caught behind minor accidents. A usual 10-minute drive home became a four-hour commute. Abandoned vehicles littered streets. City transit struggled through drifts and whiteout until finally shutting down service at 6 p.m. Cellular networks became overloaded, leaving callers with busy signals. Even the mail didn't go through. Officially, Saskatoon received only 17 cm of snow with some surrounding areas getting 28 cm. However, it was the powerful winds that blew snow into monstrous waist-high drifts and lowered visibility to zero for hours that created such dire conditions. Many residents said it was the most frightening time of their lives. Total cleanup costs approached $1 million. On the heels of the blizzard, frigid Arctic winds pushed temperatures into the -30°s with a windchill of -46 causing scores of frostbitten patients to show up at hospital emergency departments. A record number of Canadians became infected with West Nile virus in 2007 - some 2,351 people compared with the previous record of 1,481 in 2003. This year, 98 per cent of all clinical cases occurred on the Prairies where the deaths of eight people were linked to the virus. Saskatchewan led the way with 1,422 confirmed or suspected cases of the illness. Except from travel outside the province, no cases of West Nile virus were contracted within the three northern territories, Atlantic Canada, Quebec or British Columbia. Perfect mosquito breeding conditions in summer and the delay of the first hard frost in fall facilitated the spread of the potentially deadly virus. Further, more infected mosquitoes and birds were able to survive the mild winter. Heavy rains in the Prairies in May and June - 150 per cent above normal - created plenty of standing water where mosquitoes like to develop. Record heat and humidity followed in July and early August providing excellent breeding conditions for the mosquito largely responsible for transmitting the virus to humans. Not only did mosquitoes make an earlier appearance in 2007, they bred in greater numbers, increasing the risk of exposure to the virus. Further, with warmer summer weather and a prolonged frost-free fall, more people were outside longer increasing their exposure to mosquitoes. A Valentine's Day "Weather Massacre"
A massive winter storm stretching halfway across North America packed a lot of wicked weather - from terrible tornadoes in Louisiana to Paul Bunyan-sized snowfalls in southern Quebec - along with a good amount of rain, freezing rain, ice pellets and biting windchills. The powerful winter storm slammed into Ontario and Quebec just prior to and on Valentine's Day, forcing the closing of schools and sending cars and trucks spinning into ditches. In Toronto, Ottawa and Montreal the weather forced countless delays and flight cancellations, mostly to large American cities. For florists, their busiest day of the year was their worst nightmare. Bursting with stock and scrambling to get it out the door, florists usually double the number of delivery drivers they employ on Valentine's Day. But with forecasts on February 14 projecting huge snowfalls and treacherous road conditions, they had to quadruple the number of drivers, yet still couldn't make all deliveries. Hamilton-Burlington, Ontario took the brunt of the storm as frigid air blowing over warm lake waters created a narrow snow band aimed directly at the western end of Lake Ontario. It dumped between 40 and 70 cm of snow in the area. Environment Canada reported 30.4 cm on February 13, making it the snowiest February day on record; 16 cm the next day made it the snowiest Valentine's Day ever. The combination made for the greatest two-day snowfall in Hamilton's history. The storm caused nearly 1,000 accidents across southern Ontario, including a 70-car pile-up near Ancaster. More than 3,000 calls were made to road-side services, mostly for pulling cars from snowbanks and fixing flat tires. In Quebec's Eastern Townships, the storm buried Sherbrooke in 55 cm of snow. Montrealers dug out of 15 to 20 cm of fresh snow, piled into deeper drifts by 60 km/h winds. Some Old Montreal eateries lost about 25 per cent of the night's bookings through last-minute cancellations. For the second straight year, a late beginning to freeze-up in Atlantic Canada kept the thickness of sea ice in the Northumberland Strait and Gulf of St. Lawrence well below normal. Ice thickness was about half the norm prompting the Canadian government to reduce quota numbers in the East Coast seal hunt. Several storms late in winter broke up the thin ice, crushing and drowning thousands of baby harp seals. In waters off northeastern Newfoundland and southern Labrador, strong northeasterly winds in April pushed the ice pack against the coast creating strong ice pressures. Such stress occurs when sea ice is thicker than 15 cm and winds exceed 45 km/h for more than six hours. Much of the spring ice off Northeastern Newfoundland was more than 30 cm thick. The pack ice also contained harder and stronger old ice than is normal, creating exceptionally difficult conditions for fishing vessels. The Canadian Sealers Association said conditions were the most severe in 30 years. During the third week of April, a shift in wind to the northeast tightened the ice pack, trapping more than 100 vessels. The ice punched holes in ships prompting Coast Guard icebreakers to begin smashing through the massive pack in a bid to free sealing vessels. Helicopters rescued more than 50 fishers from their ice-bound boats, but 500 remained stranded in cold, damp weather for nearly three weeks. Lodged in ice more than a metre thick, some vessels tipped over, damaging their hulls and keels. By the end of April, southwesterly winds began moving the ice out to sea. The 2007 wildland fire season in Canada was below average for number of wildfires and near average for area consumed when compared to the 10- and 20-year averages, according to the Canadian International Forest Fire Centre. As of September 1, Canada recorded 6,324 fires involving 1,661,174 hectares. Spring was late coming across most of western and central regions and one of the wettest in a decade. Consequently, the fire season in the West was slow to start. In the East, however, a warm and dry April and May brought early fire restrictions over much of central and northwestern Ontario and the Maritime provinces. The fire situation continued to escalate in the East throughout the second week of May, especially in Quebec and Newfoundland and Labrador. Fire crews from outside the region were mobilized during May in Ontario and later in Quebec. On May 13, firefighters in northwestern Ontario battled four out-of-control blazes that had forced 300 cottagers from their homes west of Thunder Bay. In late May, a huge forest fire forced the evacuation of 1,500 residents in Sept-Iles, Quebec as fires came within five kilometres of the city. Four other out-of-control forest fires burned in the Lac St. Jean area and hundreds of firefighters from outside Quebec joined in the battle. By late June, the fire threat shifted to the Northwest Territories, Yukon, south central British Columbia and northern Alberta. Across the Prairies, the wildfire situation was quiet throughout most of July, surprising given the record high temperature and humidity. Several large fires in northern Manitoba filled the skies with black cinders and thick smoke near Thompson, Nelson House, Wabowden and as far east as Kenora, Ontario. The smoke prompted the evacuation of residents from communities such as South Indian Lake and Lynn Lake. In the middle of July, tinder-dry conditions in the southern Rockies prompted Alberta to raise the fire hazard to "very high". A prolonged heat wave, combined with thunderstorms, fuelled wildfires across the province in July and early August, resulting in more fire bans. The added humidity triggered more dry lightning-caused fires. The first week of August saw multiple fire starts in British Columbia, Ontario and Quebec. The continuing hot dry weather throughout south central British Columbia gave fire crews a priority fire to contend with. By August 15, fire bans were in place across southern British Columbia, Alberta and into Saskatchewan's Cypress Hills. By the end of August, the wildfire fire season in Canada showed signs of winding down. A narrow tongue of extremely warm air with sauna-like haze and humidity reached into southeastern Canada from the American south during early October, pushing temperatures 10°C above normal. On the Thanksgiving weekend, with turkeys roasting in many kitchens across Eastern Canada, outdoor temperatures soared to well above 25°C - unprecedented so late in the year. Toronto was one of the hot spots at 31.5°C with a humidex reading of 39 - uncomfortable conditions for the dog days of summer let alone on Thanksgiving! Until this year, the warmest Thanksgiving on record in Toronto was in 1949 when the temperature hit 26.1°C. Among the cities setting new records of 30°+ were Hamilton, London, Sarnia, Windsor, Kitchener, Toronto and Niagara. Typically in southern Ontario, temperatures hover around 15°C on the Thanksgiving holiday weekend, making a reading of 32°C for four days in a row - a record for the latest-in-the-season, and the longest consecutive string of +30°C days in October on record for both locations. The Thanksgiving weekend was the hot mark for what became the warmest October and warmest September-October on record in southern Ontario. January was the warmest first month on record worldwide - 0.85 degrees Celsius above normal. It was the first time since record-keeping began in 1880 that the globe's average temperature has been so far above the norm for any month of the year. As 2007 drew to a close, it was also shaping up to be the hottest year on record in the Northern Hemisphere. "For the first time in recorded history, the disappearance of ice across parts of the Arctic opened the Canadian Northwest Passage for about five weeks starting 11 August," the organization said. "Nearly 100 voyages in normally ice-blocked waters sailed without the threat of ice." It wasn't just the temperature. The UN agency mentioned "devastating floods, drought and storms in many places around the world." A tornado struck New York City in August, inspiring the headline: "This Ain't Kansas!" Major U.S. lakes shrank; Atlanta had to worry about its drinking water supply. South Africa got its first significant snowfall in 25 years. And on Reunion Island, 640 kilometres east of Africa, nearly 394 centimetres of rain fell in three days - a world record for the most rain in 72 hours. Individual weather extremes can't be attributed to global warming, scientists always say. However, "it's the run of them and the different locations" that have the mark of man-made climate change, said top European climate expert Phil Jones, director of the climate research unit at the University of East Anglia in England.